The versatile Sam Sorce, who came to U.M. from laGrange park, Illinois, played all nine positions during his two seasons with the Hurricanes. Sam made U.M. history on April 29, 1981 vs St. Leo when he became the first player to play all nine positions in a single game. He went 2-for-3 at bat with a double and two RBI's, recorded putouts at four defensive positions and pitched one scoreless inning. Sam also posted a one-hit complete game shutout against St. Joseph's on March 3, 1981. 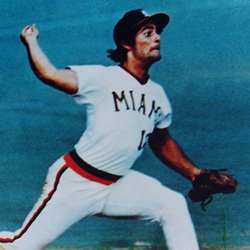 Sorce helped lead the Hurricanes to the 1982 National Championship primarily as a pitcher and designated hitter. In the 1982 Colligate World Series he went 2-0 on the mound allowing just two runs in 12 innings to finish the year 11-5. in 1982 Sam ranked eighth in home runs (16), fourth in RBI's (74) and seventh in total bases (146) on the U.M. single-season records lists. Sorce was awarded the Ron Fraser Post-Graduate Scholarship Award and was drafted by the Texas Rangers.